During May Cowra Boy’s Squadron and City of Canberra Squadron took part in an Air Activities weekend at Cowra – City of Canberra Squadron OC Tim Anderson has written the following news article. Early on Saturday morning, the first group gathered at Canberra Airport to prepare Cessna 172 Victor Golf Charlie for the flight to Cowra. We loaded the luggage and did the pre-flight inspection. The windows were cleaned and even the instruments got a bit of a polish, since the previous pilot seemed to have mistaken the glass cockpit for some sort of touch-screen. Then we started-up, did the run-up checks, taxied past the passenger terminal to runway 35, took off and headed towards Cowra. The Garmin 1000 did the hard work for us (the following day it would be the cadets doing the work with paper charts and relying on their own calculations). The flying conditions were ideal, no wind, no turbulence and perfect visibility. There were no other aircraft at Cowra so we did a straight-in approach on runway 33. Cowra has a great airport surrounded by farmland but still close to town. There is plenty of parking for both cars and aircraft, aviation fuel (no credit cards thanks) and free landings. We taxied over to the old terminal building and parked next to the other Cessna 172, which had arrived the day before. It had already been up earlier in the morning to take advantage of the clear skies and excellent weather with some lucky cadets getting a bonus early morning flight experience. Everyone gathered together for an opening parade and a safety briefing. After that is was straight into classes. Air Awareness Class 4 for the newer members and Navigation Class 2 for the more experienced cadets. Air Awareness Class 4 is a fun badge that covers the basics of flying in light-aircraft as well as some important safety information, the highlight of the course is the joy-flight. The morning was mostly occupied with lectures, with a break for morning tea. After lunch we walked across the tarmac to Fred Fahey Aerial Services. Here we had a very interesting tour of their immaculate hanger. We had a close look over the Air Tractors and Fletchers that are used for water-bombing bush-fires as well as for spraying crops. The cadets doing Air Awareness had to leave the tour early to do their air experience flights. The rest headed to the Lachlan Valley Aviation maintenance facility and checked out all the impressive tools and machines for sheet metal work, as well as some engines being overhauled and their spray painting booth. The air experience flights took over an hour with demonstrations focusing on the effects of flight controls including climbing, turning and descending. The Cowra cadets were also particularly excited to see their town and homes from a different perspective. The smooth flying conditions were especially appreciated by those who were having their first flight in a light-aircraft. The flying ended with a scenic flight over Wyangala Dam. After the tours and air experience flights it was time for the Air Awareness class to do some final revision before tackling their exam. While they did the exam, some of the parents took the opportunity for a short scenic flight. Then Cowra Squadron went home and Canberra Squadron headed for their accommodation and a pizza dinner. Sunday morning was cool, with perfect flying weather again. We started with breakfast and a logistical battle with the luggage. The ground-support team loaded all the bags for transport back to Canberra by road, to keep the weight down in the aircraft. 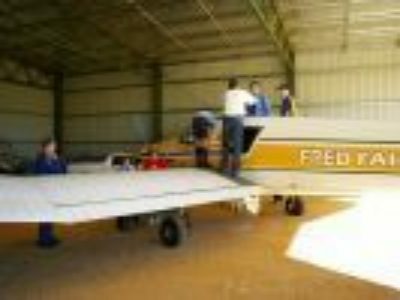 The pilots and cadets drove to the airport for a pre-flight inspection and to get the planes ready for the next leg to Temora. The navigation students had to do some last minute flight planning to work out which direction to head once they were in the air. Some thought they would just figure it out after take-off, but were advised that proper planning tends to prevent poor performance. The two Cessna 172s, with their pilots and novice navigators departed Cowra. Time spent the previous day on how to fold a chart properly was soon appreciated by all once airborne along with the realisation that identifying a farm house from the ground is very different from the air. Most cadets were able to keep the aircraft on track and the keen competition to find landmarks along the way was enjoyed by everyone. With the town of Temora in sight the next problem encountered was to find the airport and to decide which runway to use. With only light traffic in the area, both planes arrived safely and on time. Temora Airport is another great aviation facility, also with free landings and the famous Temora Aviation Museum, where the cadets had a guided tour and lunch. After the tour it was time to fly back to Canberra. Arrival into Canberra through controlled airspace was uneventful, with time out from navigation spent on taking in the Canberra scenery. It was a busy weekend for the pilots and everyone had a great time.